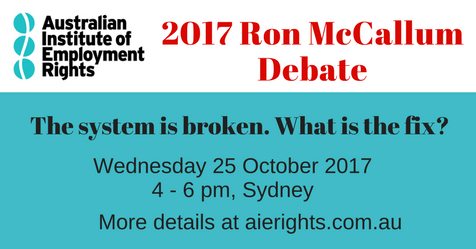 2017 Ron McCallum Debate | AIER. The system is broken. What is the fix? There is a growing recognition across the community that the workplace relations system is broken. Large scale exploitation, low wage growth and declining levels of unionisation point to the system failing workers. Business, particularly small business, finds the system too complicated and cumbersome. There are also growing challenges ahead with the changing nature of work. Our system is currently unable to deal with modes of work utilising new technologies such as the growing ‘gig’ economy, let alone technological challenges such as intensifying automation, increasing surveillance and artificial intelligence. AIER has released our Discussion Paper for this year’s debate, exploring all the issues mentioned above and the various approaches to fixing the system. Join representatives from the union movement, business, academia and the community as we discuss and debate the future of how we regulate work. A free public event. Dr Sarah Kaine, Associate Professor at UTS, whose work includes a focus on the transformation of employee relations in the digital economy. Lina Cabaero-Ponnambalam, Coordinator of Asian Women at Work and human rights activist. Don’t miss what is sure to be a compelling debate, RSVP today!